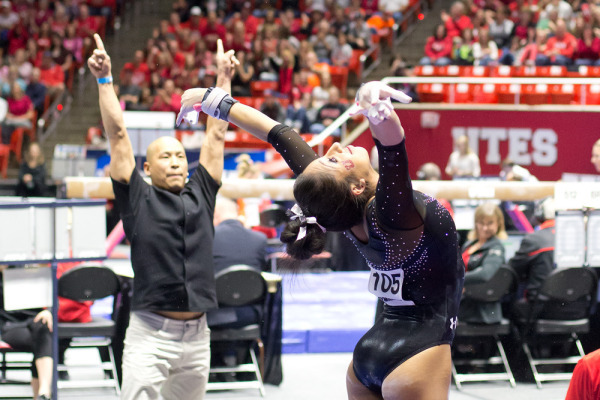 COMMENTARY — Over the weekend the University of Utah’s Red Rocks finished ninth overall in the NCAA Championship in women’s gymnastics. These talented ladies never cease to amaze me. I could talk about what might have been if the first two Utah competitors had not fallen off of the beam and a third one had not stumbled badly on her beam dismount. I could dwell on the fact that the Red Rocks’ 195.7625 score in the national semifinals was their lowest score of the season. I might even point out that Utah’s winning score at Regionals just two weeks ago of 197.125 would have been more than enough to put the Red Rocks in the Super Six last Saturday (gymnastics’ equivalent of basketball’s Final Four), with a shot at yet another national title. All of the above is true. If anybody needed to be reminded that these ladies are human, then mission accomplished. But that is not the real story that I have seen unfold this season. In good conscience I cannot end the season on a sour note just because of a few falls in the final meet. Let’s take a step back one year. The location was the same as this year — Fort Worth, Tex. Utah came within a whisper of bringing home another national championship, losing out to Florida by a mere 0.050 of a point. And that was after losing senior standout Tory Wilson to injury, making her unavailable for nationals. 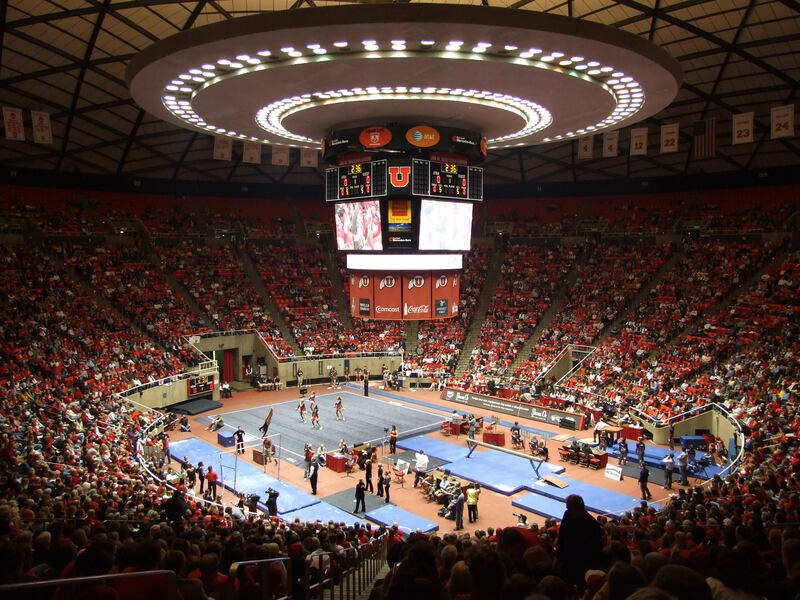 “Utah gymnastics meet” by Scott Catron – originally posted to Flickr as Jon M. Huntsman Center – gymnastics meet. Wilson was just one of many talented seniors on the squad last year. Georgia Dabritz was the first gymnast in history to score back-to-back perfect 10’s on the bars at the NCAA Championships in both the semifinals and Super Six team competition. Dabritz would go on to win the title on bars in the individual competition. This stunning senior-laden squad also boasted Corrie Lothrop and Becky Tutka. When all was said and done, over the course of their careers the four graduating seniors combined for an incredible 35 All-American honors. So coming into this year, virtually any other team in any sport (including other gymnastics squads) would be considered to be in rebuilding mode. A team that is in the process of rebuilding isn’t supposed to compete for a national championship. But somebody forgot to tell that to the Red Rocks. They simply don’t know what it means to rebuild, and instead they just keep reloading year, after year, after year. One of the returners was Kari Lee, who had performed extremely well as a freshman last season. However, a fluke injury in practice in late January knocked Lee out of competition for the remainder of the year. In other words, a squad that was short in experience to begin with suddenly got younger and even more inexperienced. However, rather than hanging their heads and making excuses, other gymnasts stepped up their game. Breanna Hughes become Utah’s top, and one of the nation’s best, all-arounders, winning both the Pac-12 and West Regional all-around competitions. Kassandra Lopez, Baely Rowe, and Sabrina Schwab each were awarded All-America status as a result of their fine performances at Nationals. Each of the other gymnasts on the squad contributed in some way to propel the team to a regional championship and mind-boggling record 41st straight appearance at nationals. As I see it, this gritty group of girls overachieved all year long just to get to Nationals and in the process, raised everyone’s expectations once they made it to Nationals. I’m not about to criticize them for being human after the Herculean effort they made over the course of the entire season. When a ninth-place finish nationally is a down year for your program, then you have one whale of a program. After the national semifinals, Farden accurately stated, “We had a great season overall and rough night tonight.” I agree on both accounts — just as there can be no dispute the Red Rocks had a rough night in the national semis, there should be no dispute that they still had a great season overall. These ladies are their own worst critics. There is really no point in anyone else trying to put them under a microscope in an attempt to dissect their errors and weaknesses. These elite athletes know what needs to be corrected, they’ll put in the necessary work in the off-season, and they’ll come back fully prepared and anxious to tackle the challenge of a new season. Call me an apologist. Call me what you will. I freely admit I see the world through crimson-colored glasses. But it’s more than that with the Red Rocks. If any fan is disappointed about these ladies finishing ninth nationally this year, then I pity your children and the unrealistic expectations you have inevitably heaped upon their poor heads. If you want to be miserable, then start cheering for the Chicago Cubs, but you have nothing to complain about when it comes to gymnastics on The Hill. Here’s to the Red Rocks and one heck of a year.